It’s erev Rosh Hashanah and I do not have time for this post, but I’m putting it out there anyway. Because there is always time for thematic holiday headgear, especially when it involves hacking a Deely Bopper. Priorities. 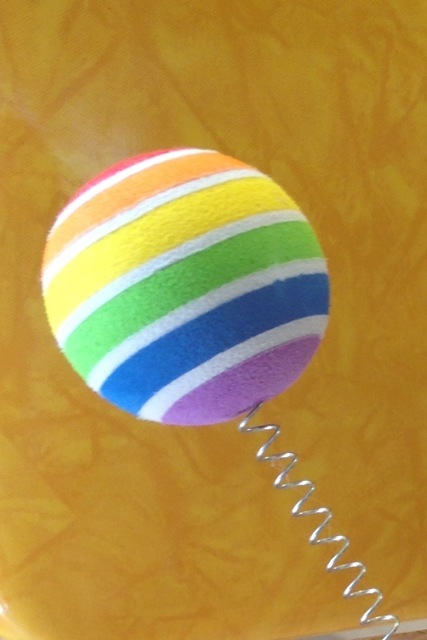 These were just rainbow balls, 2 in a pack, on clearance at Target last week. I’m keeping one pair for Lag B’Omer, when the rainbow theme will fit right in. But the other pair cried out to be “Apple and Honey.” Tapooach and Dvash. The apple was easy: I just painted the ball with thick red acrylic, cut a couple of foam leaves and hot glued them to a tape-covered bit of florist wire. The honey part was harder: I had to shave the sphere to a sort of honey jar shape, using a utility knife blade. Not recommended. I survived, but barely. The bee was something I yanked off a solar-powered toy whose copper wiring had gone kaput. The kids like it, and so do I. That is all. Now I can go buy groceries for a festive meal. 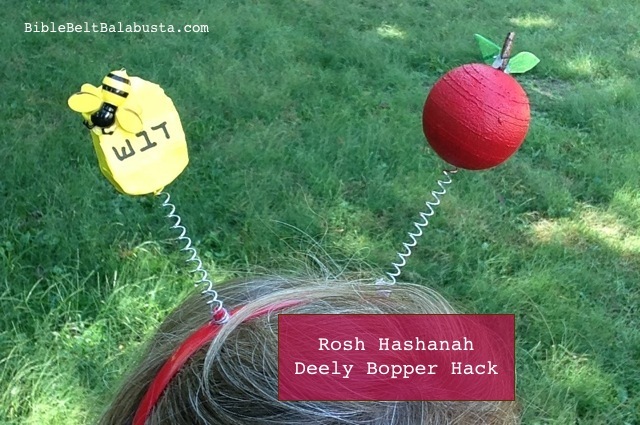 This entry was posted in Activity, Crafts, Kitsch, Rosh Hashanah / Yom Kippur. Bookmark the permalink.